Surviving the winter isn’t just all about layered shirts, wool socks, cozy blankets, and thick jackets. Keeping the pathways and the road clear from the heavy heaps of snow is a crucial job to do. Winter’s not always a friendly season and the snow definitely needs to be scooped out and removed now and then. How can you actually pull off such laborious task with little to no struggle? A shovel or a snow blower might just do the trick, but if you’re taking out some brown slush and piles of snow, these tools are probably not the best idea. But, if you have a truck like ATV, UTV, or SxSs, a heavy-duty snow plow might just be the solution you need. 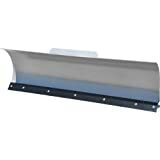 While there are different types of the blade for a particular snow plowing chore, our article provides an in-depth roundup review of snow plows with straight blades; they are specifically designed for snow drifts on larger areas and open fields. And before you hop into your purchase, check out our list of the Top 10 Best Snow Plows for Truck in 2019 as well as the detailed buying guideline. 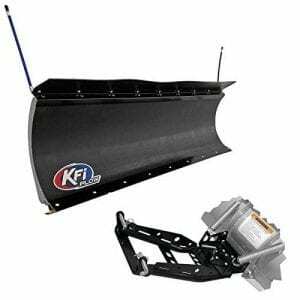 KFI is a 72-inch poly blade snow plow structured with a heavy-duty steel rib and frame construction. 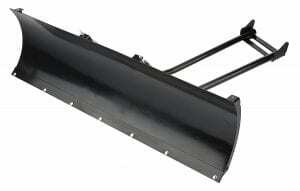 It uses a straight blade that can work on deep snow drifts and wide areas such as parking lots and roads. Compared to its contemporary designs, this KFI snow plow is specifically engineered for UTVs. Also included is a complete mounting hardware kit for a quick and easy installation. The setup is all good and easy with the use of just two ⅝-inch hitch pins. Once the equipment is attached, it acts as a front-mount system that efficiently relays the strength to the lower frame of your truck. It digs deep and lifts the heaps of snow up to the optimal height. This KFI poly straight blade is easy to attach, ideal for large areas, and incredibly reliable for many winter seasons to come. KFI’s new snow plow design is an upgrade to ramp up your truck and elevate your snow plowing chores. 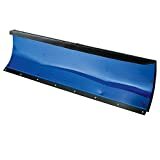 Although the 72-inch commander poly-blade already boasts its remarkable and seamless performance, this new 72-inch unit shares its versatility with its snow flap and dual curvature face for a tough snow removal. Another major plus is the plow’s compatibility with both ATV and UTVs, particularly 2005-2008 Polaris Ranger models. Included in the equipment kit is the complete mounting hardware and a plow base/push tube, but you’d need a stock front bumper to get everything done. If you’ve got a winch already installed on your truck, this is an ideal choice. Moreover, the adjustable skid pads are heavy-duty that reinforce the snow plow for an efficient and precise operation. The Glacier plow uses a sturdy and non-corrosive polyethylene blade that plows tremendous piles of snow efficiently in no time. Its width of 72 inches, heavy-duty material, and snow flaps are adequate features to perform plowing tasks on large residential areas, driveways, and roads with a few obstacles. 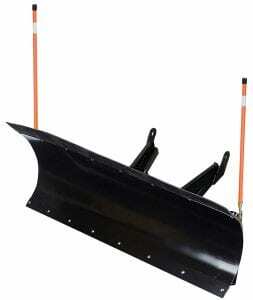 The poly blade is lightweight yet remarkably tough that takes the impact in as it digs and plows the snow. The straight cut makes it much easier to remove the snow in one blow. Resistant to scratch and corrosion, this Polaris plow can potentially withstand more winters in the long run and even the harshest temperature of the season. For the full setup and mounting system depending on the compatibility with your vehicle, you can purchase them separately. For homeowners and beginners who seek to engage in plowing jobs with the use of their own vehicles, this Meyer snow plow does an easy and quick trick. The stainless steel straight blade is just the ideal cut and material to remove the snow drifts effortlessly. 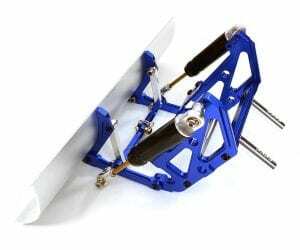 It can be a bit over the budget for some users, but its compatibility with most trucks and SUVs and the complete mounting system kit make it worth investing in. On another note, Meyer designed this snow plow with a power angling feature that allows you to shift the positions of the blades wherever you want to – left, right, up, and, down. 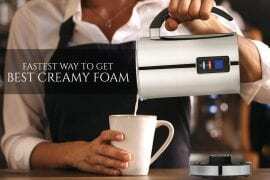 It is indeed functional and easy to operate with just one touch of the button. Do know that this is a home plow and not intended for heavy plowing. Otherwise, you’ll end up with dents and probably, damages. It won’t be a great match for uneven gravel and rough roads and driveways. Nonetheless, it is a commendable piece of equipment that has a lightweight construction that keeps the light trucks and SUVs stable and not overdriven with intense power. Digging the snow deep down the massive heaps and lifting this heavy pile out the road is what the Denali snow plow is all about. Engineered with a heavy-duty gauge steel blade and frame construction, snow plowing can be easy as a cake. Plus, the pushtubes position the blade into 5 different angles very easily. The straight blade and the wear bar jive to work on heavy snow drifts while the gauge steel material and structure minimize the stress on the vehicle and efficiently take the impact in. Besides its impressive function, the 7 gauge and 50 steel wear bars contribute to the snow plow’s durability that can withstand many winters to come. 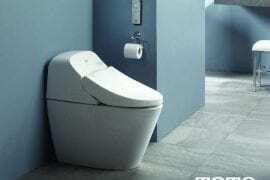 It can be installed easily with the complete mounting hardware and instruction manual. Also, check the compatibility with your vehicle. This plow is designed to fit Honda Rancher models from 2007 to 2013. This 50-inch snow plow, yet again, from Denali is innovatively designed for specific models of Polaris Sportsman ATVs. The gauge steel straight blade and frame construction ensure a stellar performance when scraping and scooping the snow out of the road or your driveway. The resilience of the blade absorbs and stabilizes the impact from plowing to prevent any damages on the ATV. 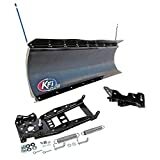 Besides the complete snow plow kit, the setup becomes much easier with the “easy connect” design that makes detaching and attaching the snow plow hassle-free. Just make sure you have a pre-installed winch to move the plow up and down. It also includes a height adjustable skid feet, pushtubes, and a wearbar. 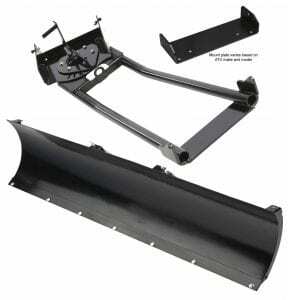 This Denali snow plow offers a wider and larger coverage with its 72-inch blade. With its remarkable width, it delivers a great fit for UTVs and SxSs. However, large snow plows have the tendency to overpower the vehicle and may seem intimidating. 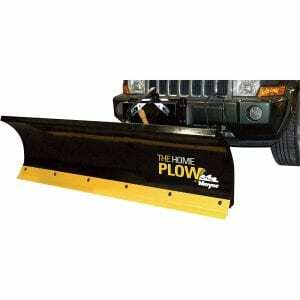 But Denali engineered the plow with optimum dispersion of force that takes even sudden impacts in efficiently. The gauge steel material is also a major plus to the overall quality of the plow. It lends maximum durability that can work on large acreage and roads for heavy snow plowing. The Impact Resistant Reinforcement System is also comprised with a leading edge stiffener and vertical stabilizer bar for superior performance and stability. And to ensure a long-lasting quality that you can use from season to season, the plow is UV-resistant and non-corrosive. 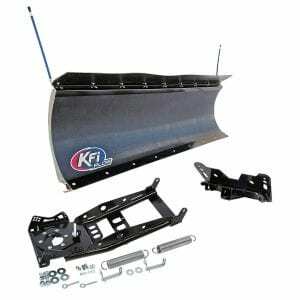 Among the vast snow plow collection of KFI products is this 60-inch straight blade that renders an excellent job for heavy snow plowing. It uses a heavy-duty and high-grade steel blade that cuts right into the heaps of snow and lifts them up with a quick drift. Even without the snow flaps, it has a 16-inch blade height for better and wider coverage. Along the steel structure are grade 8 bolts and premium quality adjustable skid pads for a remarkable durability that can last for years and many winters to come. To top it all off with a sleek and contemporary touch, it is powder coated with metallic silver. The blade is also shot blasted for a polished, tough, and resilient quality. To take over a strenuous snow plowing, Integy ramps up your plowing experience with its complete snow plowing kit. It uses a steel straight blade that provides exceptional performance and resilience. The frame construction is reinforced with heavy-duty bolts that ensure stability when performing snow plowing tasks. This snow plow boasts its superb craftsmanship and impeccable performance which makes it highly preferred by many professionals and even first-timers. The straight blade and the curvature face allow the plow to work on heavy heaps of snow on wide roads or driveways. If you have an SCX-10 off-road truck, this snow plow surely is an ideal match. 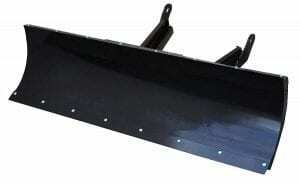 It’s also probably one of the most affordable plows you can find on the market today. Denali definitely does not fall short on high-grade snow plowing tools such as this plow kit with a 66-inch gauge steel straight blade. It boasts its remarkable performance, versatility, and ease of use that gives you a quick and hassle-free snow plowing. The contemporary design is also revamped with an Easy-Connect feature that allows detaching and attaching easily as a breeze. Just like any other Denali snow plow units, it delivers an exceptional and efficient performance while keeping the vehicle in its shape. It absorbs the impact that stabilizes the vehicle and protects it from any damages. The two wearbars and adjustable skid feet also do the wonders clear out snowy driveways and roads effortlessly. It is easy to set up and suitable for UTVs with a 2-inch receiver. 1. CONSIDER THE LOCATION & YOUR PLOW TASKS: Choosing the ideal snow plow for your truck is also based in two significant factors: the type of plowing tasks and the location or type of area where the task will be conducted. Considering these factors will help you choose the right type and size of blade and the suitable mounting or attachment system for your truck. If you’re planning to clear out the snow drifts on your yard, driveway, or any smaller residential spaces, you can settle for average-sized plows that range from 6 ½ to 8-foot wide. But if you’re trying to cover a larger acreage or vast fields and roads, wider and expandable snow plows will do the job. Straight blade – It’s all about the basic operation and it efficiently works on larger areas or roads that typically have smooth surfaces. As the simplest and the first ever form of snow plows, straight blades engage in non-complex plowing tasks and are ideal for beginners. V-blade – If you’re targeting all sorts of snow drifts and depths in steep areas and narrow roads, snow plows with V-blade will do. Such design promotes superior versatility and stellar performance that clears out snow across different types of areas with or without obstacles. It does a great job with more complex jobs. While V-blades are remarkably multifunctional and generally designed for a vast array of jobs, they fall in the highest price range. Blade with wings – This expandable blade has a great advantage on covering large areas, roads, and drive lanes. As they take over larger capacities, these detachable wings on both sides work harmoniously to scoop out huge piles of snow in a short span of time. The superb function minimizes the effort and time, and typically removes the heaps of snow in just one blow. Although the design is efficient and reliable, complexities in operation are inevitable thus professionals should be the one to take charge. 3. 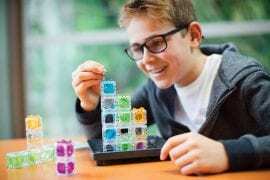 CHECK THE ATTACHMENT SYSTEM: Regardless of the size, type, and design you choose, the compatibility and ease of use are highly significant marks to check. Every snow plow is crafted with a particular attachment system that complies with the specs of a certain truck or vehicle. The function and easy set-up are positive points that would make the snow plow a total steal. Deemed as a harsh weather, you need to focus on the function and the intuitive properties and how you can put up the attachment without too many difficulties in the midst of the frigid temperatures. 4. LOOK FOR A STURDY BLADE MATERIAL: Snow plow brands may advertise a variety of blade materials such as stainless steel, polyethylene, and mild steel. These are quite popular materials and Each of them has its pros and cons that can match your preferences. Polyethylene or Poly blades are non-corrosive, scratch-resistant and gives off a polished exterior. With its smooth surface, it scoops the snow out seamlessly which lends a remarkable performance. Therefore, more and more professionals take these poly blades as their top choice. Stainless steel, on the other hand, is another topnotch pick and typically applauded for its sleek and high-end exterior. Besides the function, stainless steel blades can spruce up your truck with a cool vibe. However, this material is susceptible to dents when used on areas with rough surfaces and rocks. Mild steel also takes a spot on these durable and popular blade materials. It features incredible ductility and versatility that minimizes the vulnerability to dents. No wonder it’s been an excellent plowing assistant over the years. Despite the overall durability, mild steel doesn’t have as much resistance to corrosion as most blade materials are. 5. KNOW YOUR BUDGET: Make sure you have enough budget when purchasing a snow plow. 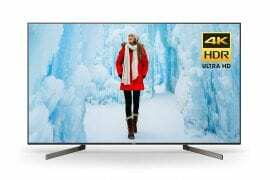 The price of such equipment is no joke and usually vary from 3 to 4-digit price range. 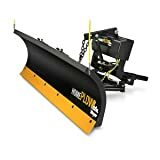 If you’re trying to fit right in your budget, you can check out snow plows with straight blades as they are more affordable compared to V-blades. No matter what your preferences are, purchasing a high-quality snow plow for your truck is a good investment and functional equipment you can use for many winter seasons to come. Clearing the roads and parking lots from the massive snow is definitely not a very easy job. It takes, time, effort, and the right choice of tools to finish the task. Not to mention the harsh winter season that can leave you freezing in the cold breeze. But, if by chance, you have a truck that you can use, a snow plow must be the best equipment you should invest in. Whether you’re a beginner or a professional, you can find the ideal snow plow for your truck with our detailed buying guide and top ten list as your reference. Prior to your purchase, you need to consider the blade material, the type of job, the location, the durability, and the attachment system of the snow plow, and eventually find the one that best suits your needs.